Product #45681 | SKU DRDRWEDKDV | 0.0 (no ratings yet) Thanks for your rating! 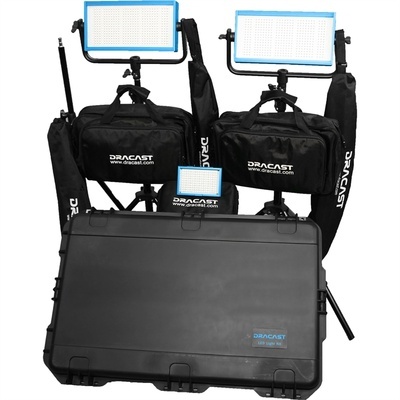 The Daylight Wedding Kit with 1x LED160AD and 2x LED500D with V-Mount Battery Plates was put together by Dracast as a 3-point lighting solution capable of AC or battery operation. The kit includes one 5,600K LED160AD on-camera light with shoe mount and AC adapter and two LED500D Pro 5,600K panels complete with yokes, V-Mount battery plates and multi-voltage AC power supplies. Two 6.6' light stands and a kit case for the lights are included for storage and transport. The 1/2 lb LED160AD is a compact, battery-powered, daylight-balanced, on-camera light has a high CRI 95 for accurate colour reproduction and an aluminium chassis for strength and durability. It features a built-in dimmer that can adjust the light's output from 0-100% without flicker. The LED160AB is powered by an optional NP-F battery or the included multi-voltage adapter. The light produces a spot 45° beam angle, providing high output with an even spread. The LED160AD employs an accessory channel for optional diffusion gels for easily softening of the light quality without time-consuming taping or clamping. A 1/4"-20 tap allows you to mount the light to your camera's accessory shoe via the included hot shoe adapter. The LED500D Pro Daylight LED light is an ideal choice for the studio or location work where colour accuracy, control and flicker-free output are of major importance. The LED500D's daylight-balanced output is well suited to outdoor work or colour matching HMI fixtures, while its high CRI of 95 renders colours with precision and fidelity. Dimming from 0-100% is conveniently done with a back-panel knob that adjusts the output with negligible colour shift. The LED500D generates the hot light equivalent of 500W but you won't have to be concerned about the talent's comfort - the panel runs barely warm to the touch. And the low electrical draw of just 30W means a timely return on your investment. 1x LED160AD On-Camera Light: 6 x 4 x 2"
2x LED500D Panels: 12 x 6 x 2"